Twice Grammy-nominated, Killswitch Engage has sold over 3 million records worldwide, with The End of Heartache and As Daylight Dies both certified Gold in the U.S and Silver in the UK. The band’s latest album – 2016′s Incarnate – landed at #6 on the Billboard Top 200, #1 on the Current Rock Albums chart, and debuted at #1 overall in Canada, #5 in Australia, and #10 in both the UK and Germany – a testament to their international reach. 2018 will mark the end of the Incarnate album cycle, which saw the group reach new heights with its collection of anthems that set the heavy music world ablaze. 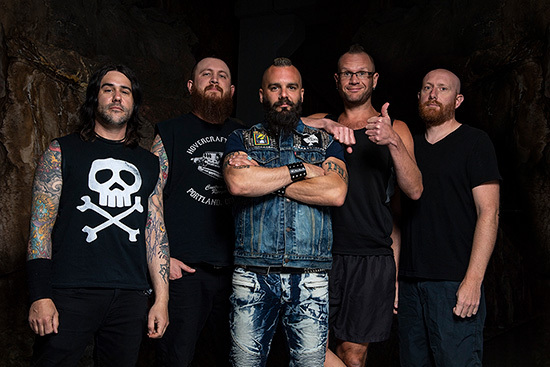 Co-founders of Killswitch Engage – guitarist/backing vocalist Adam Dutkiewicz, guitarist Joel Stroetzel, bassist Mike D’Antonio, and lead vocalist Jesse Leach (who returned six years ago after a decade-long absence) – plus longtime drummer Justin Foley, are currently working on a new album, with Adam Dutkiewicz handling producer duties once again. Employing their usual unrelenting determination to continually release powerfully potent work, Killswitch Engage plans to deliver another trend-resistant, timeless record that feeds the soul, touches the heart, and strengthens the mind. Stay tuned for more news about this new album coming soon!